The Trek Skye SL is here for 2011 and is ready to accompany long time fans of off road mountain biking on serious stints into the wilderness. However, it is priced to have wider appeal and will be a great boon for weekend expeditions, no matter what your experience or skill level. It is set up for female riders who want a fast, secure place to ply their trade and as such, the hardtail design is a benefit rather than a drawback. The Trek Skye SL has a strong and hardwearing aluminium frame with female-specific geometry. On the front, a Spinner 300 fork features a hydraulic shock that will provide up to 100mm of travel. This component will make sure that even the rockiest surfaces or steepest inclines can be tackled without jarring the joints of the rider or limiting their speed. An eight speed gear system using Shimano components goes hand in hand with Tektro brakes and although this is not a top of the line women’s mountain bike, it is difficult to find a better mid-range consumer option on the market. 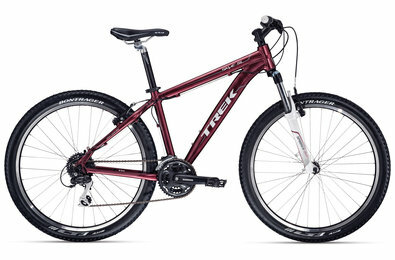 With a maroon frame the Trek Skye SL is a good looking mountain bike that does not go overboard in terms of styling. Its frame looks chunky and capable whilst its Bontrager tyres and all-white front fork give it presence and elegance. Looks are far from the top of the list of selling points in the mind of a serious cyclist but the Trek Skye SL proves that you do not have to buy a bike that is deficient in this area.